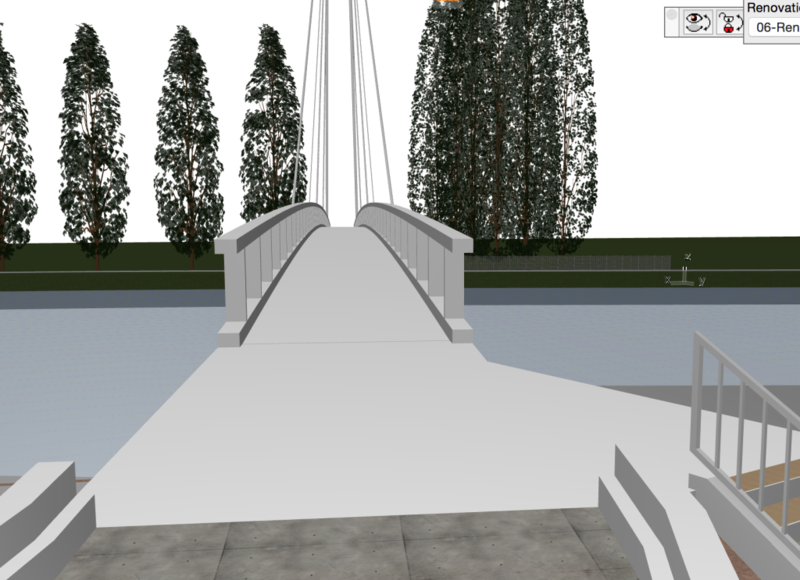 Proposed foot-cycle bridge over the Trent between Trent Lane and The Hook (Lady Bay, West Bridgford): Update of 5 October 2015 to people and organisations interested in the development of our plans. 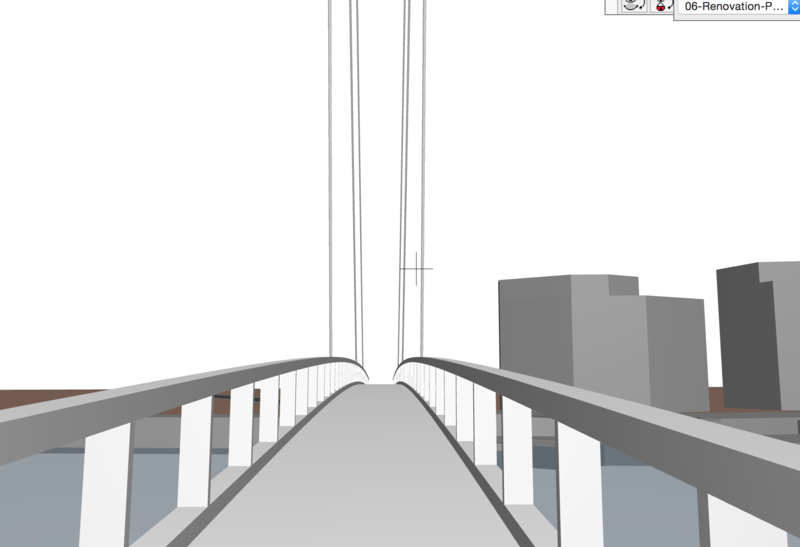 I realise that it is quite a while since the last update on our bridge plans. We have done a lot of work since our Steering Group was formed just over a year ago and have plenty more to do but are taking it step by step and are making definite progress, for example with the recent strong encouragement from the City and County Councils to take further our work on completing the feasibility study. work drawing on their wider experience to help us strengthen the case for the bridge, for both commuting and leisure use. Below is my recent reply to an article by Ben Ireland of the Nottingham Post in which he stated that the recent grant of planning permission for a new development east of Trent Lane might scupper the plans for our bridge. This reply was published prominently in the paper on Friday 2 October (p14), along with a photo of the very successful Sustrans Diglis foot and cycle bridge over the River Severn in Worcester, opened in 2010, whose experience we think is particular relevant for our project, along with that of the similar bridge opened very recently across the River Thames between Reading and Caversham (see pictures attached). We intend sometime soon to arrange a special meeting in Worcester to see this bridge and its approaches at first hand and to have detailed discussions with the people from Sustrans and the local authorities in that area about how the design for this bridge evolved and lessons for us from their planning and implementation experience, including the development of their case for funding. More and more people are now showing interest in our proposals and offering support. I should like to pay particular tribute to two Pedals members, Adrian Harms and Howard Gill from Bite Design Ltd, who have very generously donated their time to help with the very useful CGI (computer generated images) work mentioned below. On behalf of the Steering Group promoting plans for foot-cycle bridge between Trent Lane and The Hook (Lady Bay) I would like to reply to your article in the Post of 24 September in which you stated that the plans recently approved by the City Council for 81 flats on the Park Yacht Club could “scupper” our proposals. With help from Adrian Harms and Howard Gill from Bite Design Ltd, who have recently produced some very useful computer-generated images of the proposed bridge and its approaches we have been exploring various design and access options. These take account of the recently approved plans and other possible developments nearby and we are confident that some of these options will still be possible if the flats go ahead. As part of our wider work we are also gathering information on different bridge designs and similar projects that have been implemented elsewhere such as the very well-used and successful Diglis Bridge over the River Severn in Worcester, and the bridge over the River Thames between Caversham and Reading .We are still working on more possible options for the design of the bridge and its approach ramps, taking account of the different opportunities and constraints on both banks of the Trent, and the opinions both of local people and relevant agencies including the local authorities, the Environment Agency and the Canal and River Trust. Another step forward is our very recent discussions with Sustrans about commissioning them to do some further work to help us complete our feasibility study, both to help strengthen the economic case for the bridge and detailed predictions of likely usage, based on their substantial wider experience including the Diglis Bridge which seems particularly relevant to our project. Our Steering Group includes representatives from Pedals, the Nottingham Local Access Forum, the Nottingham Civic Society, River Crescent Residents’ Association and Blueprint Regeneration. There is much further work for us still to do but we have been very encouraged both by the support in principle for our project by more another 19 local groups and also recently by the strong encouragement from the City and County Councils to complete our feasibility study work and demonstrate the very strong case for such a bridge at this particular site. This would be a great facility for walkers, cyclists and runners, for both leisure and commuting purposes, well-connected to many other routes on both banks including the further stretches of riverside path on the north bank soon to be built between Meadow Lane Lock and Colwick Park, and to many existing and proposed new housing areas north and south of the river, providing a much safer and more pleasant alternative to Trent Bridge and Lady Bay Bridge, with their very heavy traffic and bad air pollution problems. Proposed Trent Lane to The Hook foot-cycle bridge Steering Group. We have been working closely for some time now in consultation with Keith Morgan of the City Council and Paul Hillier of the County Council on a series of revisions to our earlier detailed feasibility study work to argue in detail the case for such a bridge east of Trent Bridge and our reasons for advocating this particular site as the best in overall terms, for walkers and cyclists, and for leisure and commuting use. The further work on which we are engaged is now including, with much appreciated financial support from different Steering Group members and the City and County Councils, commissioning some specialist work from Sustrans on detailed predictions of bridge usage and the economic justification for the project. This work, for which we gave the go-ahead on 8 March, and is likely to take about a month, is taking place in parallel with some further internal work, including a detailed SWOT (Strengths-Weaknesses-Opportunities-Strengths) analysis of the 4 theoretically possible sites for the bridge. 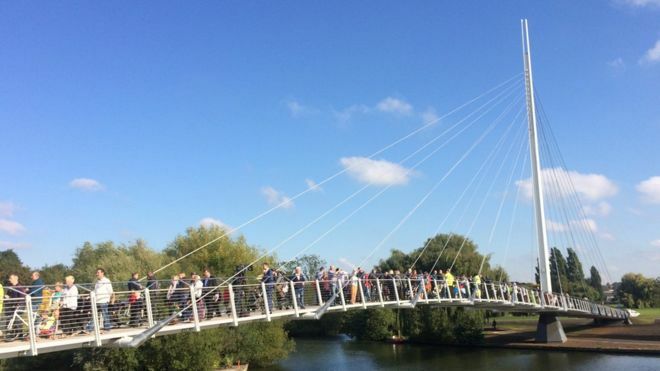 We will soon be making a submission to the Rushcliffe Borough Local Plan consultation, coordinated with the recent similar submission to Nottingham City Council’s Local Plan consultation to help raise the profile of the case for the bridge as a strategic link for Greater Nottingham. 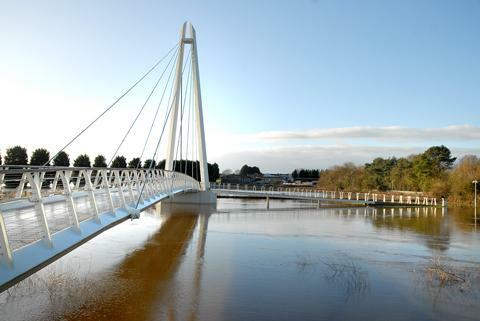 This follows our recent meeting with the Rushcliffe planners to help ensure that we are adequately addressing all the planning issues including the differing sets of issues in accommodating the bridge landings on both banks of the Trent. These are all important steps as we continue to chip away on the long process of getting the case for the bridge fully accepted by the City and County Councils, to be then followed by the long process of trying to secure funding from a variety of sources. Two of us from the Steering Group, John Rhodes and myself, visited Worcester in December to learn more at first hand from local County Councils and Sustrans officials involved with the planning and implementation of their very successful Diglis Bridge over the River Severn, completed in 2010, with funding from the Lottery-assisted Connect 2 Project Fund, (unfortunately now closed!). This meeting, and the subsequent site visit on bikes, confirmed our impression that the experience of that project is particularly relevant to what we are proposing locally. This includes the upgrading of approach routes on both sides of the river, and the experience of the Steering Group, with wide representation of the local authorities and other relevant agencies, that was used to plan and deliver the whole project, including the bridge itself and the other project components such as the improved approaches. Update of 19 October 2016: Trent Lane-The Hook foot / cycle bridge plans: a long and tortuous saga! 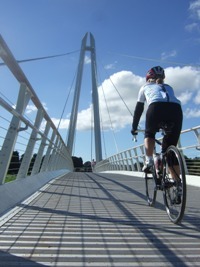 Recent months have seen close working with Sustrans Research and Monitoring Unit on a study of the economic impact of the proposed bridge, to complement revised feasibility study work by the Steering Group. After various delays we now hope that this will be completed in the next few weeks, to help us to make a convincing case as to why such a bridge is needed and why the site we proposed is the best option. This work has included some revised detailed work on how our site compares with the other main contender, i.e. putting shared paths on one or both sides of Lady Bay, an idea first put forward by consultants in 2005 but never taken further by the City and County Councils. Although this option might be preferable for many more confident and experienced cyclists, we think that it will be difficult to make it attractive for less confident cyclists, especially when approaching from the West Bridgford side. 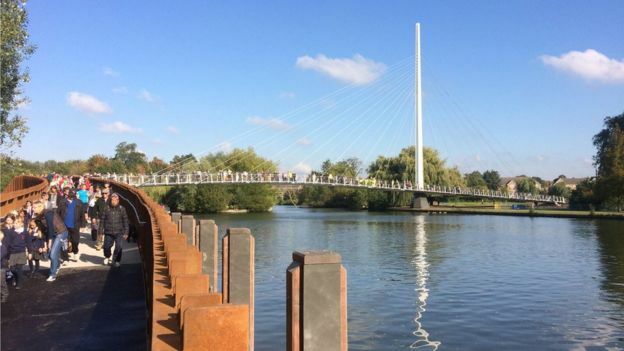 It would also be much less attractive for walkers who we think are the biggest potential users of a new bridge, especially when making trips between Colwick Park and Colwick Woods on the north bank and Holme Pierrepont Water Sports Centre and Country Park on the south bank.